MFS100 is high quality USB fingerprint sensor for fingerprint authentication for desktop or network security. 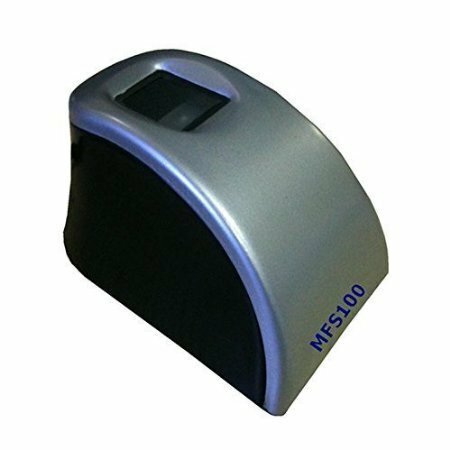 MFS100 is based on optical sensing technology which efficientlyrecognizes poor quality fingerprints also. MFS100 can be used for authentication, identification and verification functions that let your fingerprint act like digital passwords that cannot be lost, forgotten or stolen. Hard optical sensor is resistant to scratches, impact, vibration and electrostatic shock. Rukmini Creation is a leading company established in the year 2010, engaged in offering a broad collection of All Type of Biometric Devices, AEBAS, AADHAR KIT , FINGERPRINT SCANNER , SWIPE MACHINES, GPS DEVICES, Horizontal Gas Safety Device, Vertical Gas Safety Device, Single Burner Gas Stove with FFD, Double Burner Gas Stove with FFD, Triple Burner Gas Stove with FFD and Four Burner Gas Stove with FFD. Manufactured making use of premium quality basic material and advanced tools and machinery, the entire collection is in compliance with the standards laid down by the industry. Appreciated for their longer life, reliability and simple usage, these are highly demanded in the industry. Also, we assure delivering these products safely at the end of our customers to maintain the trust we have acquired over the years. We also provide services of our products like repair and maintenance. It is established a professionally managed with an aim of pioneering in innovative Kitchen Security solutions for households. A majority (98%) of accidents caused due to LPG occur due to negligence and ignorance in usage of LPG. The organization also wants to create a safety awareness drive for Domestic LPG users and provide high class global products of highest quality, lastly, to impart Disaster Management Training to general public in fire & safety solutions. “Rukmini Creation” offers the individual an opportunity to participate in a business perfectly suited to all who have dreams and are willing to invest / take genuine efforts to make their dreams come true.